One of the world’s leading providers of navigation products and software solutions, Navigon has announced its new premium portable navigation device – NAVIGON 7200T, which incorporates a host of next generation navigation features including Reality View Pro, Lane Assistant Pro and Free Real-Time Traffic Updates for Life, aiming to enhance your navigation experience. Free Real-Time Traffic Updates for Life – Real-time traffic updates allow routing around congestion by including traffic flow, incidents and alternate routes and works for the lifetime of the product right out of the box without any registration processes, fees or additional hardware. Voice Destination Entry – Advanced voice recognition allows drivers to specify their destination by simply speaking the address. NAVIGON’s distrinctive inconic interface guides the users through the process. Landmark View 3D – The NAVIGON 7200T brings a new dimension to the map with hundreds of richly-textured 3D landmarks across the U.S. and Canada like the Empire State Building and the White House. Reality View Pro – Never miss an exit again with the next generation of Reality View – providing more coverage in more places. Reality View Pro displays photo-realistic 3D views with actual road signs and lane guidance for virtually every highway interchange and exit drivers will encounter. Lane Assistant Pro – Helps drivers prepare to make an upcoming exit or turn by providing clear visual lane guidance. NAVIGON’s second generation of Lane Assistant provides a lane map complete with arrows and actual road geometry. Flat-Panel Design – NAVIGON is not only committed to designing products that are appealing to the eye, but are also designed to make navigating the device simple and effortless. The NAVIGON 7200T sports an innovative, frameless touchscreen. The responsive Flat-Panel Touchscreen adds to the sleek and elegant exterior of the 7200T. Fewer clicks to get you there – The latest generation of NAVIGON software makes entering and finding information fast and simple with, on average, fewer clicks than any competitor product. NAVIGON’s SmartSpeller feature helps guiding through the entry process. Go Hands-Free – The integrated Bluetooth feature helps keeping both hands on the wheel while still staying connected. The NAVIGON 7200T acts like a Bluetooth speakerphone to hold conversations without all the distractions, plus your contacts are download automatically for one-touch calling. Advanced Text-to-speech – Spoken Directions with Street Names lets drivers keep their hands on the wheel and eyes on the road with advanced phonetic text-to-speech technology to ensure proper pronunciation of streets. Zagat Ratings and Reviews – Shows where to wine, dine, and unwind with a built-in ZAGAT guide sheparding users to restaurants, hotels, nightclubs, attractions and golf courses. With millions of standard points-of-interest and branded icons onboard users always have a gas station, restaurant or golf course at their finger tips. DirectHelp – Help is a click away with this DirectHelp, providing instant driving directions to and contact information for nearby hospitals, police stations, roadside assistance, and pharmacies. Exit Guide – NAVIGON’s Exit Guide enables users to search upcoming exits for one of six POI categories – food, gas, lodging, rest areas, auto service or shopping. And, with one click, the NAVIGON 7200T navigates there. Faster. Faster. Faster – NAVIGON’s new software gets to the right route in less time. Our new platform delivers our most responsive interface to date with dramatically improved route calculation times to get directions more quickly. Instant Fix GPS – With NAVIGON’s new Instant Fix GPS receiver (SIRF InstantFixII Receiver), the NAVIGON 7200T triangulates global position in a matter of seconds and improves performance in urban canyons and areas with tall trees. Favorites as POI – Shows stored addresses with name on the map marked with flags. 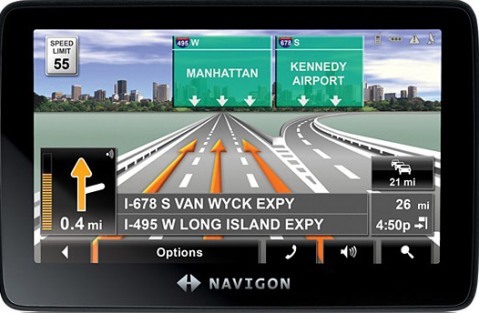 The new Navigon 7200T GPS device which sports a 4.3-inch, flat-panel touch screen is expected to hit the market in coming October for $449.